Ex Big Brother Africa Hotshots' star Stellah Nantumbwe aka Ellah played her first soccer match in her home city Kampala, Uganda recently. 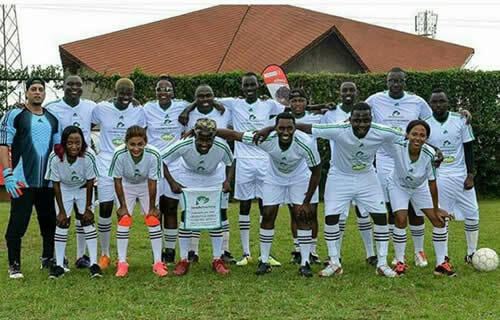 The actress, singer and television presenter took part in a Charity football match that was titled "Celebrity For Charity" football match organised by former Miss Uganda Dorah Mwima. The main aim of this Charity Football Match was to fundraise money that will improve health, nutrition and sanitation in different homes and care facilities for underprivileged newborns and toddlers in Uganda. The competing two teams were Team Navio and Team Salvado which saw Ellah play for Team Salvado, unfortunately Ellah's team lost 6-3 to Team Navio. Ellah took to social media appreciating the opportunity she was given to take part in the Charity Football Match for a good cause. "Thank you for having a heart of Gold. May God bless your endeavours! This was so much fun and such a great experience. I am always happy to be a #CelebrityForCharity so next year please,Let's have a girls only match. My uniform was a force to reckon with.I played football... I actually got my booty up and ran allover the field...I almost scored #MyTeamLost #HairOnFleek #LovingMyNewHips #TeamSalvadovsTeamNavio #LatePost #HappyNewYear lovely People. You have been dearly missed" Ellah wrote.